Generate and print list of id cards using data from excel file with DRPU ID Card Designing Software. ID card maker software is useful to design and create different types of identity cards including Employee ID cards, Student ID cards, Faculty ID cards, Visiting ID cards, Sports ID cards, Photo ID cards etc. Start designing ID cards using predefined templates available in software, or using wizard or blank format, or edit existing ID card format. Allows user to design ID card with "One (Front Side)" or "Two (Back Side)" sided ID card as per requirement. Create ID cards in different shapes including: Rectangle, Rounded Rectangle, Ellipse. ➬ Download DRPU ID Card Design Software and start designing and printing bulk ID cards today! DRPU Corporate ID Card Maker tool designs multiple ID cards using Batch processing series option. Software provides facility to create Visitors ID cards and Gate Pass for visitors. 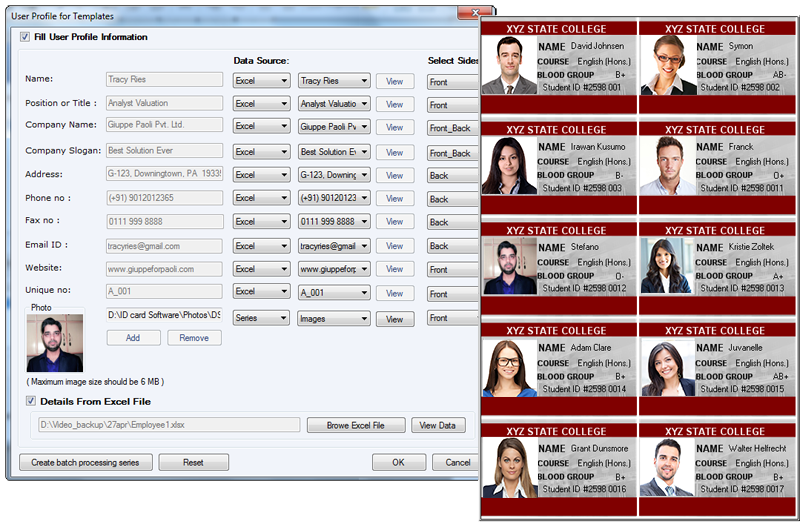 Student ID Cards Maker Software is developed with Live Group and Batch Processing Mode for ID card designing of multiple students. Software facilitates you to browse data from excel file. Create Gate pass with an option to capture image of visitor using camera setting option. Software provides facility to add visitor details to database and can search visitor's record as per requirements. Design ID card for multiple people using Live Group and Batch Processing Mode. This mode supports Excel Data and Bulk opertaions with Live features. Software helps you to crop a single image or to crop multiple images for ID card using Image Cropping Tool. 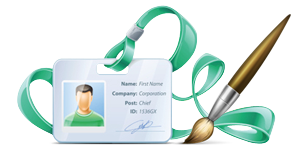 Facility to add details of your visitors to the database while designing visitor ID card. DRPU ID Card Maker Tool has advanced feature to send designed ID cards to single or multiple email IDs via email settings. Provides print settings feature to print designed ID cards as per your requirement. You can also view designed identity cards before printing by print preview option. Design ID cards using different image designing tools such as Text, Ellipse, Triangle, Line, Rectangle, Star, Barcode, watermark, symbols, etc. Software has Camera setting feature to capture the image for your ID card. Use Design Business Cards Software to create variety of business cards (standard or customize) with the use of advanced image designing objects and barcode setting feature. Card and Label Design Software designs and prints different types of cards including ID cards, Visiting cards and Greeting cards. Software creates labels including Postal label, Tickets, price tags and stickers. Greeting cards maker software designs greeting card using its advance image designing objects. Design Greeting Cards for Anniversary, New Year and for other similar occasions. Software designs birthday cards using card image designing objects, templates, symbols, clipart and pictures. Software generates cards in different shapes and size including Rectangle, Ellipse, and Rounded Rectangle. Logo designing tool facilitates users to create and print corporate business logo. Software generates professional looking business trademark symbol using various image designing objects. Wedding card designing software creates marriage invitation cards using ClipArts, WordArt and other image designing objects. Software designs bulk numbers of invitation cards using batch processing option.